This two-storey brick building on the north side of Portage la Prairie was designed by architect C. H. Mousney and constructed in 1910. 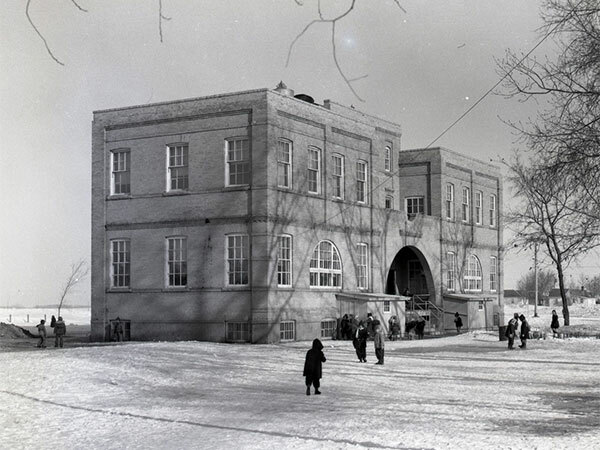 Its four classrooms opened for use in January 1911 and electric lights were installed in 1917, but water and sewer service did not arrive until 1941. The school roof was badly damaged during a tornado that hit the city on 22 June 1922 but it was repaired in time for classes to resume in September. By the late 1960s, the school was said to be “structurally and academically obsolete.” It had no gymnasium, library, or music room, and no staff room or office. Every available space was being used for classrooms, including two in the basement separated by the furnace room. There were only single washrooms on each floor, so boys and girls had to use them in shifts. Rather than commit the resources to upgrade the building, the School Board chose to close it in June 1972 and the students were sent to the newer La Verendrye School nearby. 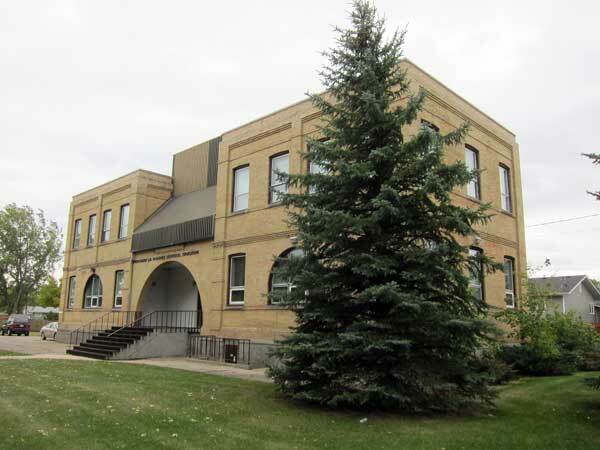 Six years later, the building was renovated as offices for the Portage la Prairie School Division. It is the only known example of an urban ward school remaining in Manitoba. The teachers of the North Ward School included: Mildred Trimble Rutledge (1911-1913), Mrs. Edward-Jones (1911), Pearl Webster, Myrtle McCarthy, Stella McCuaig Denyer (1920), Miss Kestler (1919-1920), Kathleen Manson, Ruth McMillan (1920), Mona Oulton (1921-1922), Jessie Roe Smith (1921), Kathleen Garland (1924-1925), Miss Horton (1924-1925), Grace Tucker (1924-1928), Edith Ogletree McKillop (1925-1926), Ruth Francis (1927-1928), Miss McKay (1928), Ina Pearson (1929-1934), Bernice Nixon (1929-1934), Miss Abbott (1929-1934), Miss Hickling (1934), Miss E. Galbraith (1935-1940), Kay Robb (1935-1941), Elsie Barton (1937-1938), Lal Langford (1938-1942), Nel Tate Owens, Helen Piloski (1941-1972), Dorothy Leonhardt (1942-1943), Gertrude Milne (1943-1944), Chris McLean Troughton (1944-1945), Miss Sammeter (1945), Helen Sklipowich (1946-1947), Bentina Erlendson Ronald Boulter (1947-1948, 1955-1960), Catherine McDougall (1948), Miss Devereau (1948), Anne Poyser Pallister (1949-1951), Mrs. Leonard Clark (1949-1950), Miss Rubinek (1950), Mrs. Harold Simpson (1951-1952), Mae I. Leslie (1952-1954), Evelyn M. Hopkins (1951-1952), Beth Sladek (1953-1955), Mrs. Pirot (1954-1955), Ann Shykitka (1954-1957), Martha Holovach (1954-1955), Miss E. Courice (1954-1955), Mrs. Ella Cook (1955-1964), Lillian Beddome (1955-1956), Miss M. A. R. McCall (1956-1957), Mrs. A. L. Lamont (1956-1957), Jean Yaremkevich (1959-1964), Alice Boychuk (1960-1961), Denise Wagner Chiponski (1960-1962), Mrs. Skinner (1960-1961), John Dueck (1961-1962), Ralph Barry (1961-1962), Cornelius Furdievich (1961-1962), Miss S. Hodgkinson (1964-1965), Mrs. Bergen (1964-1965), Mrs. E. Moggey (1964-1965), Mrs. P. McRae (1964-1965), Edith Lamont (1965-1970), Velma McDonald (1965-1966), Marion McCosky Makarchuk (1965-1967), Peggy Curwen (1965-1968), Delores Wooley (1966-1968), Martha Meikle (1966-1967), Margaret Giesbrecht (1967-1969), Rose Browning (1967-1968), Iris Parrack (1968-1972), Miss Lois Vust (1968-1972), Brenda Meikle (1968-1969), Mrs. R. Browning (1968-1969), Sheila Purvis (1969-1972), Dorothy Crealock (1969-1970), and Lee Lutz (1970-1972). Source: PCI Archive, Vopni Press Collection, 0262a. Death registration [Annie Timmins Barber], British Columbia Vital Statistics. “Portage lists teaching staff as school opens,” Winnipeg Free Press, 5 September 1951, page 34. Obituary [Anne Ethel Poyser Pallister], Winnipeg Free Press, 6 July 2011. We thank Michael Mauws, Hazen Barrett, Morris Boychuk, and Nathan Kramer for providing information used here.